Following the huge success of the first Sherlock Holmes movie directed by Guy Ritchie, Warner Bros are fast-tracking a movie sequel! Scriptwriters Kieran and Michele Mulroney have already been hired to pen a script for Sherlock Holmes 2. 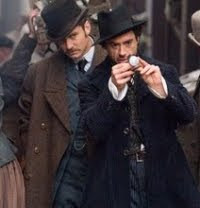 Of course Robert Downey Jr and Jude Law will reprise their roles respectively as Sherlock Holmes and Dr Watson. It hasn't been confirmed yet if Director Guy Ritchie would be back to helm this new Sherlock Holmes movie, but we can fairly bet that he'll sign up to develop further his modern take on Sherlock Holmes. The main plot of Sherlock Holmes 2 is still kept secret for now, but according to the rumor, Professor Moriarty, the criminal mastermind in the shadow of the first opus, will be the main villain of the upcoming sequel. And the same rumor is electing Brad Pitt as Moriarty, Sherlock Holmes' ultimate nemesis. The movie Sherlock Holmes is listed by IMDb for a release in 2011. This is quite likely to happen since filming of Sherlock Holmes 2 is set to start in June 2010. 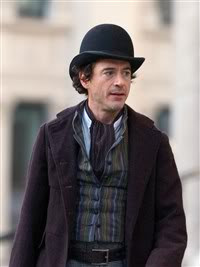 Hope to get more information about Sherlock Holmes 2 soon!